Michigan Attorney General Bill Schuette has announced that he will be filing a suit to put a stop to former Green Party candidate Jill Stein's presidential vote recount, calling the request "frivolous" and "expensive." The Republican attorney general, a Donald Trump supporter who originally chaired the presidential campaign of Jeb Bush, called on the Michigan Supreme Court Friday morning to put a halt to the recount before it even begins. Stein had filed a request to recount Michigan's near 4.8 million ballots on Wednesday, just hours before the recount deadline for the state closed. Schuette's argument against the recount relies on the same rhetoric the Trump team has been using throughout the entire process. He makes the case that Stein, who only received roughly 1 percent of vote in Michigan, is not an "aggrieved" candidate entitled to a recount, and is rather using this effort as a means to waste both time and Michigan taxpayers' money. Logistically, he also says that Michigan would not have the time to complete the recount by the Dec. 13 federal deadline. All of these factors, Schuette argues, is reason enough to put an end to the recount that could — though by a long shot — see Michigan's electoral college votes flip from Trump to Clinton. Michigan voters rejected Stein's candidacy by massive margins but her refusal to accept that state-verified result poses an expensive and risky threat to hard-working taxpayers and abuses the intent of Michigan law. We have asked the court to end the recount which Stein is pursuing in violation of Michigan laws that protect the integrity of our elections. It is inexcusable for Stein to put Michigan voters at risk of paying millions and potentially losing their voice in the Electoral College in the process. The filing of this lawsuit came just as Trump's attorneys sat down with the Michigan Board of State Canvassers to argue why the recount should not take place. The board had to call a one-hour recess just as the morning meeting began, however, when news broke that Schuette had filed his own lawsuit against the recount. After considering Schuette's legal action in a closed meeting, the board reconvened to hear Trump's attorneys make a similar case. An attorney representing the Stein campaign, Mark Brewer, told the Detroit Free Press that Schuette's lawsuit was "unprecedented interference by a partisan attorney general on a matter that should be handled routinely by the Board of Canvassers." He went on to say that the attorney general was merely "trying to please his Republican constituency," with his ambitions of running for governor motivating his decision behind the lawsuit. 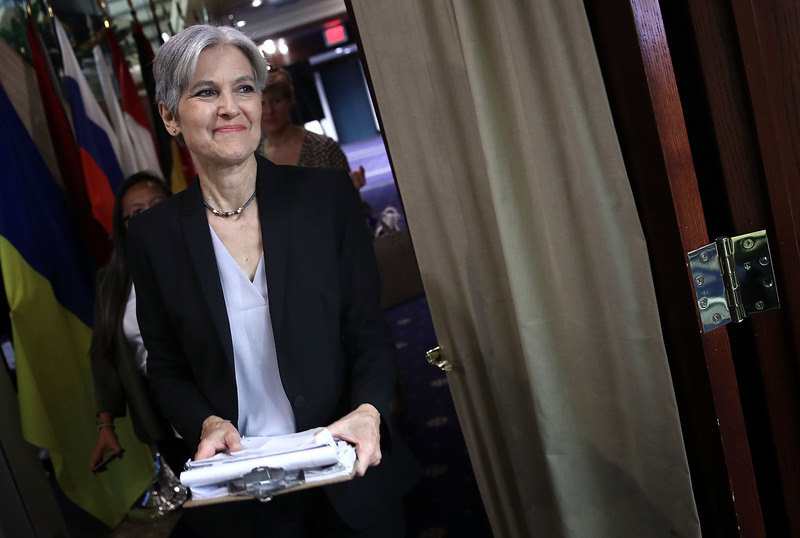 With the Michigan recount now pending, Stein might have to solely rely on recounts scheduled for Wisconsin and Pennsylvania.